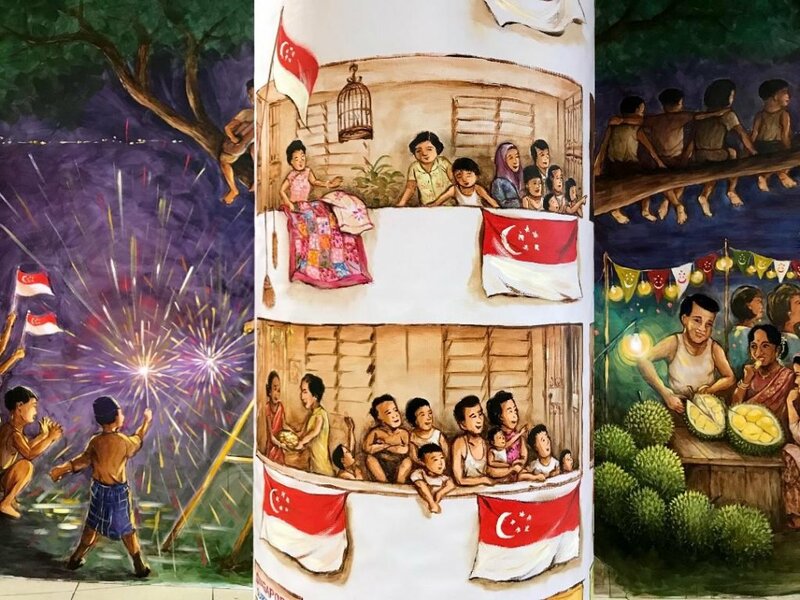 This hand-painted mural captures my memories of how Singapore used to celebrate National Day in her early years of independence. I remember Singaporeans from all walks of life gathering to celebrate the big day at the old Queen Elizabeth Walk, which was then a seafront. They went there to watch the fireworks light up the sky above the old Merlion Park, and the ‘Sea Dragon’ bumboat-floats parading the mouth of the Singapore River. Many peddlers selling favourite local snacks like ice-cream and satay added to the party mood. Children could be spotted climbing the giant rain trees and playing sparkles. The whole place brimmed with joy, togetherness and pride. On the column, I painted a scene of the heartland. Families would climb to the higher-floor corridors of their new HDB flats to enjoy a panoramic view of the fireworks. 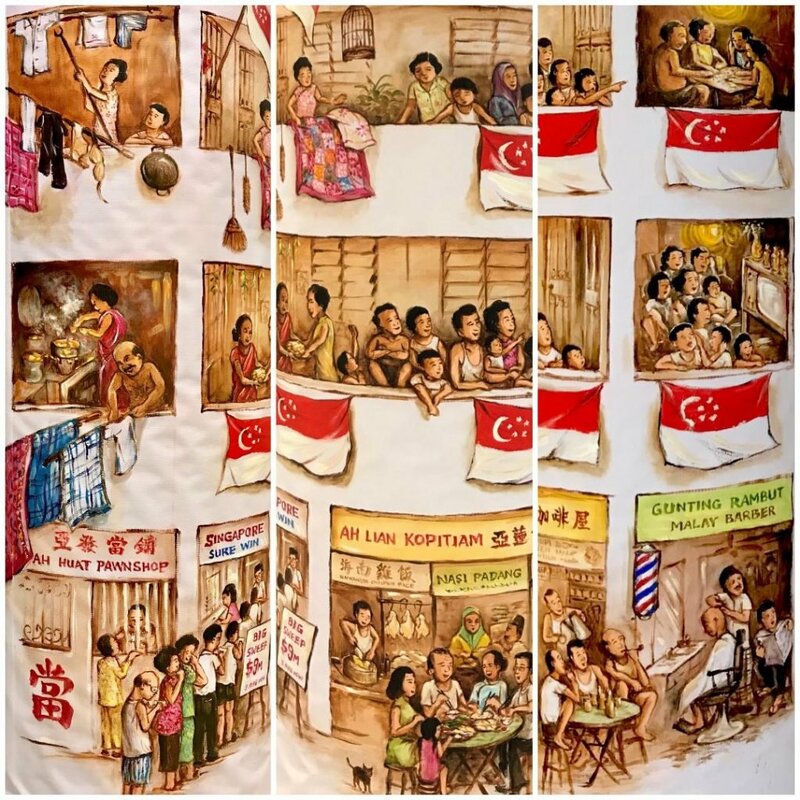 Take a peep into the windows and shops and find familiar scenes of everyday lives in our HDB heartland. 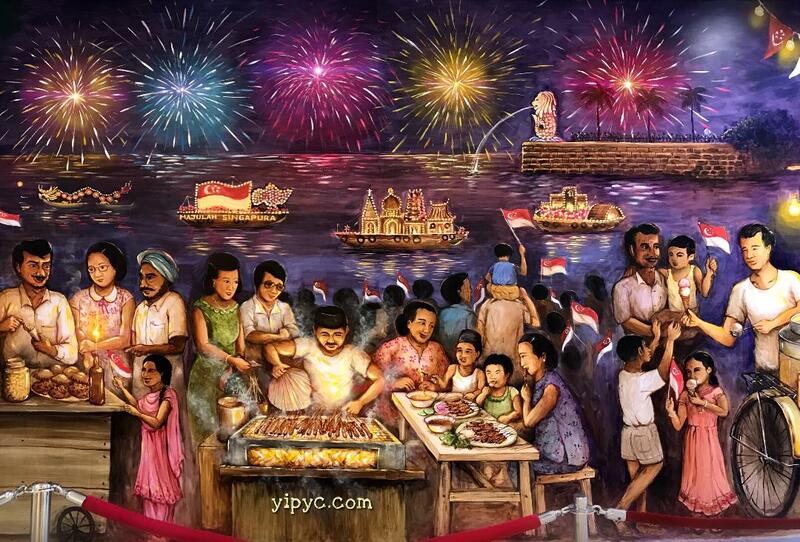 I hope this mural gives a glimpse into an older Singapore celebrating her birthday. Happy 53rd National Day! Mural is at HarbourFront Centre, Level 2 Northlink to Vivocity.